What about Bergeon Clip On Spectacles? I need some magnification advice. I’m considering these Bergeon “Clip-On-Spectacles” as I wear glasses. So far, I’ve only used cheap Chinese magnification glasses from eBay, and I’ve been happy with them as they give me a stereo vision (never really liked to look with one eye only). However, it is a constant hassle to switch between my ordinary progressive glasses and my Chinese magnification glasses. So that’s mainly what motivates me. Come to think of it; perhaps progressive glasses combined with a clip-on is a bad mix? Perhaps it would be better to use a pair of reading glasses with a clip on? I’m right-handed and I'm right-eyed, so am I correct to assume that I should go for the right-eyed version of the “Clip-On-Spectacles” to make room for screwdrivers and tweezers? Seems obvious but I want to make sure. What magnification would be the most convenient for working with screwdrivers and tweezers on a movement? The focal length for a 10 power magnification is just an inch, so I assume my head would then bump into my tools. I have a stereomicroscope (20X/40X) that I use when I need to get really close. The focal length of the 5 power clip-on is two inches, perhaps still too close? What is your experience, and what level of magnification would you recommend (10.0, 6.7, 5.0, 4.0, 3.3, 2.8, or 2.5)? Hi VW for general work I wear a head set with a full binocular vision over my glasses It has a lift up front which contains two lenses, for close work I have to remove my glasses and use the double lens on my left eye, If I can find a picture of them I will post it. Does anyone use a microscope? Im new to this hobby but i repair electronic equipment under x10 barlow magnification for solder work & have been tinkering with watches of late. I have a few types of magnification glasses like the one pictured above and im finding the microscope being way more practical for me. I have a huge collection of magnification products that I have tried, including dentist Bono’s, eye pieces, traditional flip down eye pieces (not cheap). 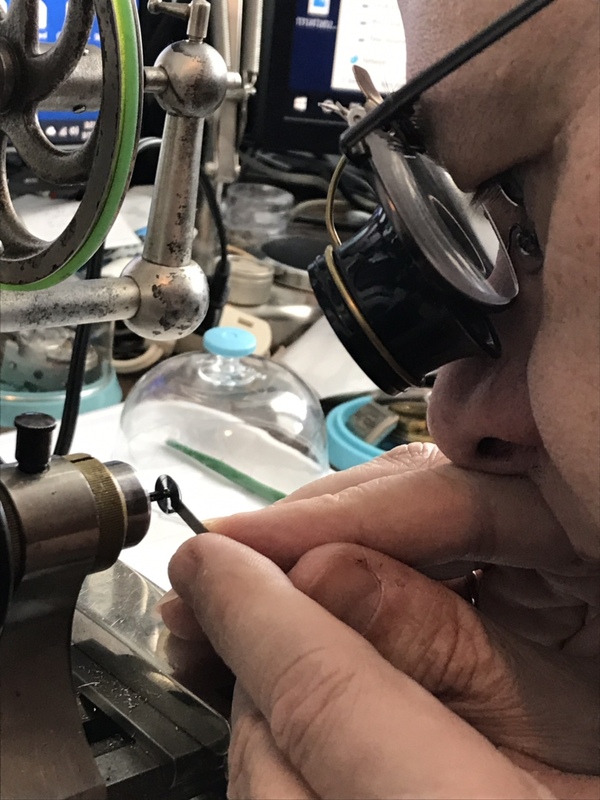 I eventually bought 3.0 reading glasses and added a clip on loop at x2 power for general close work and x10 clipon loop when I work in the Lathe. The good thing is both my eyes are protected when using my Lathe. The clip on flipdown loop is the best and fastest. Oh ok i didnt consider lathe work, i knew you guys all wear spectical type magnification for a reason. Do you use a watchmakers lathe. If so you will be looking at, perhaps, a small balance staff while cutting it and need to protect the other eye that will be open. I do have a few lathes. Wow! They all look so nice and shiney too! Are you selling any or are they collection peices? I might be able to let one go. I just got carried away buying them. Lol i could only imagine mate, im not sure if im going to go that deep in the rabbit hole just yet sorry for high jacking OP & taking this a bit off topic too. I can see you're wearing the eyeglass on your left eye. Is that because you're left-eyed or because it's more convenient when you do lathe work? The Bergeon clip-on that I'm considering comes in left-eye and right-right versions so I need to get this right for the work I do when assembling/disassembling movements using tweezers and screwdrivers (no lathe work, yet), and as I mentioned I'm both right-eyed, and right-handed and I fear that if I get the wrong version I will end up in an awkward working position. And what would be a good level of magnification? Or perhaps a more relevant question is; what would be a tolerable focal length to make room for my head, tweezers and screwdrivers? Thanks for the tip! However, I've already tried this and I'm afraid I found it too bulky for my needs. Oh yes, I just couldn't live without my 20X/40X stereomicroscope! I use it when oiling jewels holes, pallets, etc. (to me it offers a much higher level of precision), and when I need to understand what I'm actually looking at (dirt, debris, discolouration, rust, and so on). The only inconvenience is that the design om my scope is such that I need to move the part under it, rather than bringing the scope to the part, and of course, I can't move my head around the part. If interested I wrote more about it in this thread. Anyway, for disassembly/assembly of watch movements, the scope isn't all that convenient, except for things like setting anti-shock springs. I don't wear glasses but I'll add that I use a 3x loupe (right eye, right handed) for general bench work, and use a zoom microscope for inspection and oiling. Around here the glasses wearers tend to take them off and use a conventional loupe but that may be due to their particular eyesight. I know others who use the clip on loupes and are happy. For general work anywhere between 2.5x and 4x is ok. Going above, even 5x, can be very tiring for the eye. The high power loups are more for inspection use or short duration. For lathe work I have a scope mounted over it that gives 10x or 20x. 10 for most stuff, 20 for really fine work. Where did you get the scope for lathe work? Any pictures? VW i have read your other thread and it seems this has been an issue for you for quite some time. Other members have commented on using microscopes for lathe work which could be an option later down the road if you decide to get into lathe work too. Here is my stereo microscope setup for mother board work and i can work under it for hrs at a time with no eye strain. You can see the makeshift stand that i made for it,which was only intended to be temporary untill i purchased a boom stand but never did. I can zoom out of work to get a full view of a movement and also zoom in to see jewel holes too. The working clearance is about 6- 8in so there is no issue getting tools under it to do work. I payed $100 for the scope 2nd hand from ebay and an extra $40 for the widefield x10 barlow to get away with it on the cheap. Alternatively (AM scope) have awesome gear used in the micro solder work industry which you could have a look at if you are interested. Attached is pics of my gheto setup boom stand and the zoom range of the scope at that hight. Here is a link to the a suited scope that are cheap enough and are great quality for micro work. I found this scope in a flea market. It's an Olympus, I like it because the head is quite compact. The base of my lathe had a gooseneck lamp that I removed, and I cobbled together the vertical support and mounted it there. It swivels out of the way in an instant. Before this I had a similarly compact old Leitz on a stand, there are lots of single or dual power small stereo scope heads out there, often with boom stands already which make them basically ready to go for watch lathe work. I have been using a scope over the lathe since I finished school 20 some years ago, I don't think I could work without it. I will look for a stereo microscope in the future to consider a similar setup.